From 01 Decmeber to 12 December, the social media accounts of the EU at Expo 2015 we will be following the development of the “Lima Climate Change Conference” in Peru, which is focusing its attention on issues related to climate change, renewable energies, environmental protection and equal access to resources. 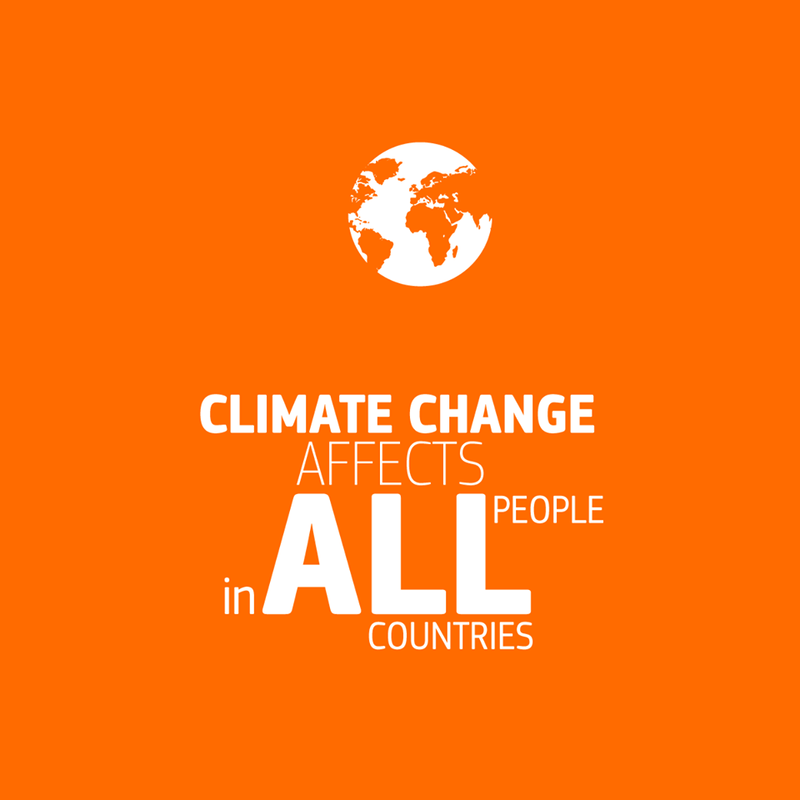 The Conference is a cornerstone for commitment to the future of our climate, paving the way to the “United Nations Climate Change Conference” the will be held in Paris next year. Over 100 million tonnes of food are wasted annually in the EU. If nothing is done, food waste is expected to rise to about 126 million tonnes by 2020. Between 24 November and 30 November, the European Union at Expo 2015 will dedicate our social media activity to preventing food waste! Follow them on Twitter, Facebook and Instagram to see their campaign to stop food waste! Wasting food is not only an ethical and economic issue but it also depletes the environment of limited natural resources. All actors in the food chain have a role to play in preventing and reducing food waste, from those who produce and process foods (farmers, food manufacturers and processors) to those who make foods available for consumption (hospitality sector, retailers) and ultimately consumers themselves. The central goal of EU food safety policy is to protect both human and animal health. We cannot compromise on these standards but, in co-operation with Member States and stakeholders, are looking for every opportunity to prevent food waste and strengthen sustainability of the food system. This website provides information on EU actions to tackle food waste, communications materials to help raise awareness, a repository of good practices in food waste prevention and a food waste resources library. #EUdebate2014 and social media: who won? 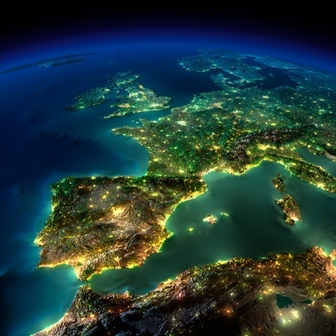 Whether some people disagree over the interest, the engagement or the passion displayed by the four candidates, I think this was a very good exercise for the creation of a European online public space, as already theorized by Tony Lockett. Almost 46.000 mentions of #EUdebate2014 on 28 April represented a quite significant value in terms of engagement around the first real pan-European debate for the candidates to the Presidency of the European Commission. How involved were the people on social media? Let’s have a look. Here is a wordcloud of the most used words on social media together with #EUdebate2014. We see the hashtags related to the campaigns of Juncker, Schulz and Verhofstadt (#withJuncker, #nowschulz, #guy4europe) were rather prominently used together also with reference the great selfie taken ahead of the dialogue. Dana Manescu, team leader of the Social Media Team in the European Commission, had a terrific idea ahead of the next European elections which will take place between 22 and 25 March. SloganEUizer is a crowdsourced database that collects all slogans used at the national level by political parties campaigning for the upcoming European elections. “They say social media messages ought to be short and sweet. Let’s see how sweet are the slogans for the EP elections.” writes the author. This is a database continuously built by Dana and several enthusiastic contributors. Have you seen a slogan somewhere? Please share it! 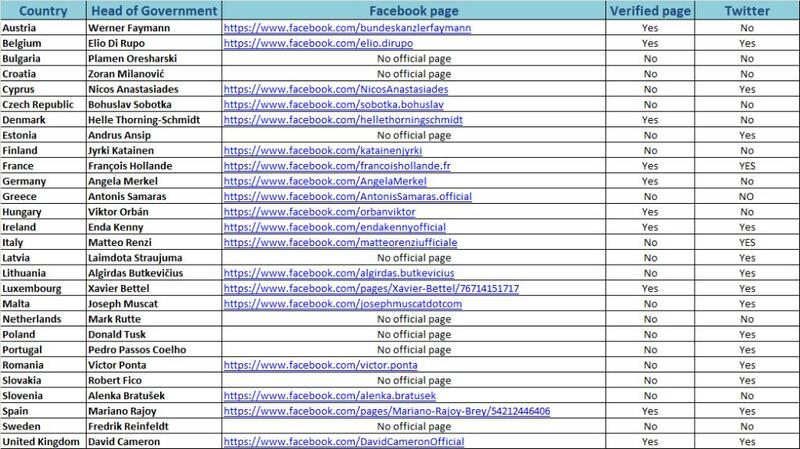 EU Heads of Government on Facebook: who’s scoring best? 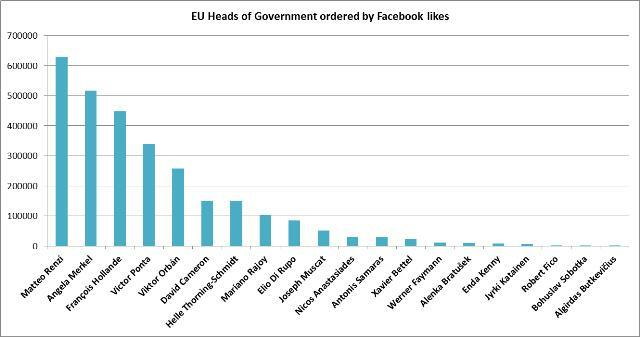 After releasing the ranking of EU Heads of government on Twitter I thought I should not stop there and I should also check their presence on the most populated social media: Facebook. As I explained in the previous post, the communication strategies of EU Heads of Government vary greatly. Some Prime Ministers are not on social media, some are just on Twitter, some are just on Facebook some are on both platforms. As we can see from the table above, out of the 19 Heads of Government on Facebook, 10 are actually verified. Some well-known public figures and Pages with large followings are verified by Facebook as having an authentic identity. You’ll see a blue badge next to a verified profile or Page’s name. Facebook verifies profiles or Pages to help you be sure that they are who they claim to be. 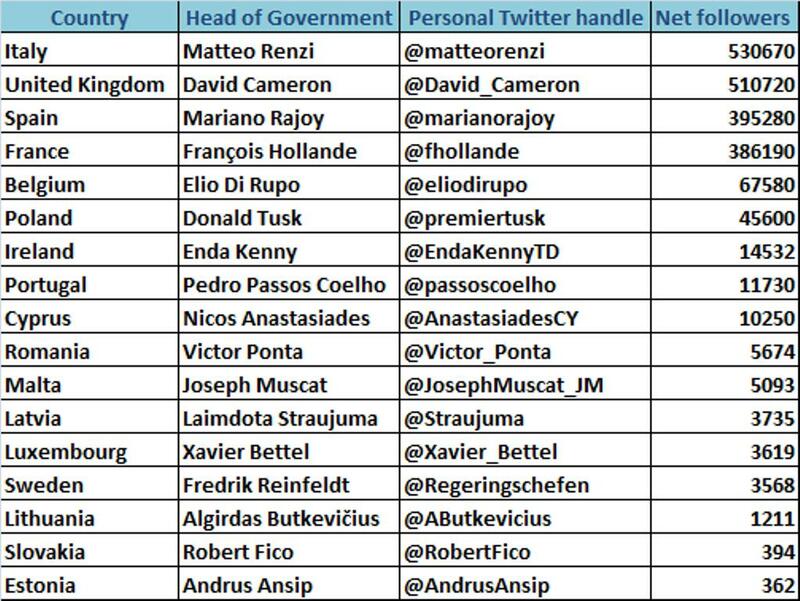 As we can see from the chart above, as for Twitter, Matteo Renzi is the most followed (or “liked”) EU head of government on Facebook with 628.360 likes, followed by Chancellor Merkel (who does not have a personal Twitter account) with 517.415 and Président Hollande with 448.191 likes (Hollande is also the second most followed Twitter account for an EU Head of Government). 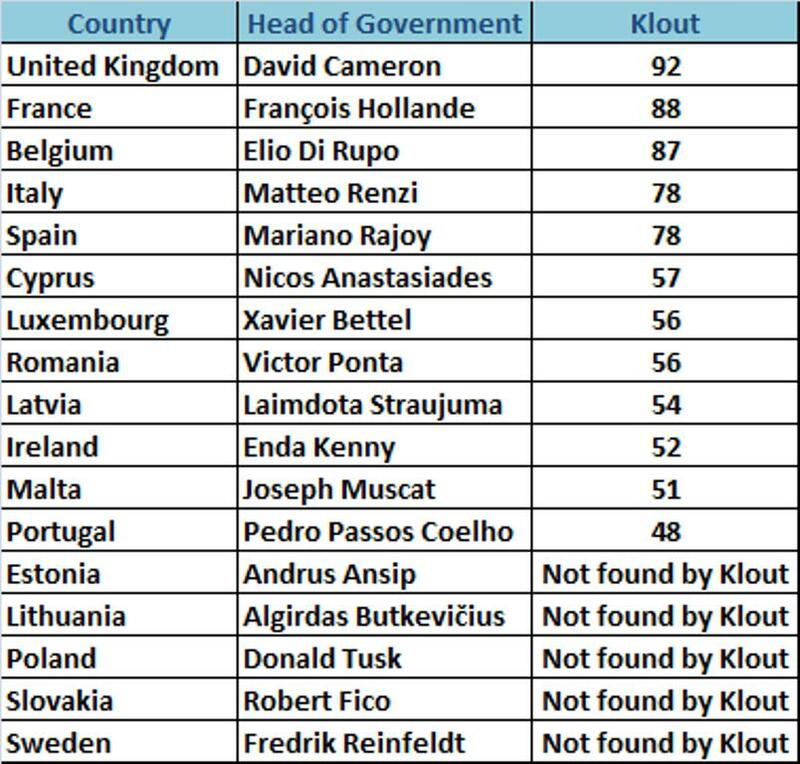 David Cameron, who has the third most followed Twitter account, is in 6th position in this ranking. Some time ago I had the chance to participate in a very good seminar chaired by Jon Worth a well-known communication consultant in Brussels. The seminar revolved around the topic of public diplomacy and the digitalization of international relations. One of the first things that came up in the event was the “attempt” to define public or digital diplomacy. I say “attempt” because indeed there seems to be quite a lot of confusion about what this practice should be and most importantly how digital diplomacy should be carried out. A common definition in international relations presents public diplomacy or people’s diplomacy as the communication with foreign publics to establish a dialogue designed to inform and influence. Another definition that came up from the previously mentioned seminar was “it’s what Carl Bildt does.“ Another expert on the field, Andreas Sandre explains in his latest piece for the Huffington Post how digital diplomacy has been “redefining itself since its inception…It has evolved from 140 characters to a myriad of opportunities embedded in the very nature of the digital era, from crowdsourcing to big data. While we have not yet outgrown Twitter and Facebook — still key ingredients for any government’s digital strategy — foreign policy is fast moving towards more innovative ways to change its elitist undertones and become a truly participatory, collaborative forum.” You should also check out Crowdsourcing tips and ideas for digital diplomacy where Andreas collects tips, definitions and recommendations from digital diplomacy experts. However, according to this definition we end up defining digital diplomacy merely as the adaptation of diplomacy to new communication technologies which have not really affected diplomacy per se but have simply modified the way people are reached by diplomatic bodies, institutions and representatives. What most people call “digital diplomacy” for the large part I would call “public affairs” or even simply broadcasting. 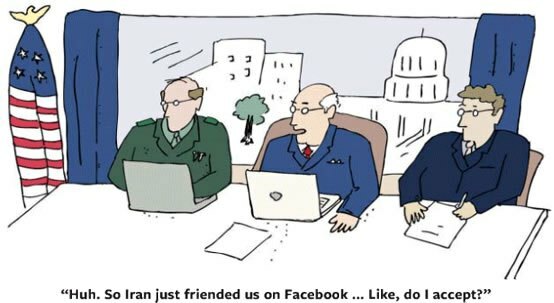 This is why digital diplomacy is just not a thing yet. There are perhaps a few Scandinavian diplomats who are using social media and web 2.0 tools to really engage among their diplomatic circles and directly with the citizens, one above all, Mr Alex Stubb. However, these people represent maybe 0.01% of the 77.7% governments of the 193 UN member countries that have a presence on Twitter. 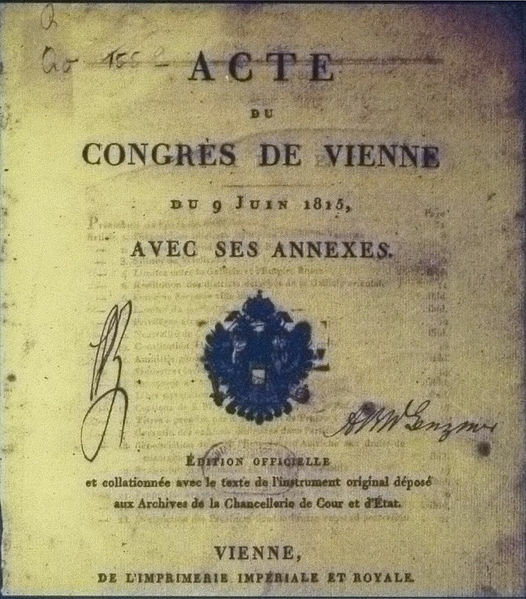 During and after the negotiations of the Congress of Vienna in 1815 I suppose that Klemens Wenzel von Metternich communicated with Viscount Castlereagh and Tsar Alexander I orally and via documents printed on paper possibly sealed with wax stamps. When world leaders started communicating via phone, did political scientists start talking about “telephonic diplomacy?” The question here is rhetoric. David Cameron uses Twitter, so does newly appointed Italian PM Matteo Renzi and so … is this digital diplomacy? Obviously not. A different role though is played by embassies and other diplomatic bodies who more and more provide useful information to citizens but still are very much constrained by their own lines to take and bureaucracy. Also, they mostly limit themselves to broadcasting ans little engagement. Nonetheless, they are not to be blamed for this. They do provide a valuable service to citizens worldwide. So, what is #digitaldiplomacy for you? 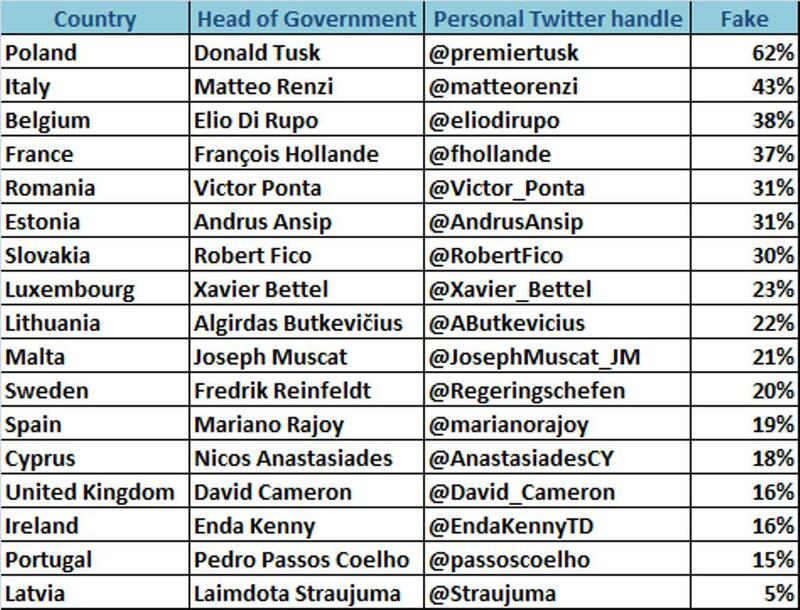 Personal Twitter accounts of European Prime Ministers: who’s scoring best? Followers aren’t everything, as I have already advocated in a recent post discussing the presence of the European Commission on social media. However, this ranking gives you an indication of the popularity of certain world leaders on Twitter in comparison to others. 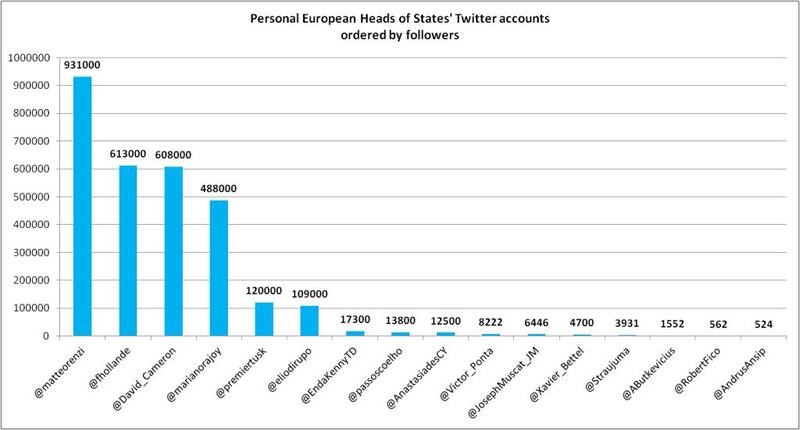 Out of the 28 heads of states in the members of the European Union, 16 have a personal presence on Twitter. These people have a presence on Twitter independently from their position. David Cameron will always be Mr. David Cameron even after his mandate as British Prime Minister will be over and the same applies for instance to Francois Hollande. Some governments such as Greece and The Netherlands use an account for their Prime Minister regardless of who occupies this position. In the case for instance of Italy, you can see both the account of newly elected Prime Minister Matteo Renzi and of whoever sits at Palazzo Chigi although in this case the account is basically the voice on Twitter of their press office. I assume that the choice around which Twitter strategy to adopt depends partly on the political system. In fact it wouldn’t make much sense to implant the Dutch approach in Italy which is de facto the most unstable political system in the world (62 different governments in 68 years). Newly-“elected” PM Renzi is by far the most followed European Head of State with 931K followers, followed by Monsieur Hollande with 613k and David Cameron with 608k. I say “elected” between quotation marks because I was not particularly happy with the way the new government was appointed. Fake followers represent a common threat for the popularity of public and political figures on social media. I made an analysis based on Fakers, a tool that detects the amount of fake followers an account has. Here are the results by net followers. You can’t really prove and be 100% sure that somebody has bought fake followers. However, when you get very high rates of fake followers (like in the first 4 cases listed below) the question is at least legitimate but not assetive. This point is quite interesting in the Italian political sphere where former comedian and current leader of the Movimento 5 Stelle Beppe Grillo largely bases his political campaign on his “alleged” digital popularity. The truth is that only 9-6% of Mr Grillo’s 1.4 million followers as considered “good” by Fakers. Anyway, here is the ranking. Polish PM Donald Tusk‘s followers are fake by 62%. Matteo Renzi follows with 43% and Belgian Prime Minister Di Rupo is just behind with 38%. Here is the ranking of the accounts ordered by their percentage of net followers. Fake followers don’t seem to have changed the order in this ranking. Thanks to Twiplomacy, I found out that @zoranmilanovi, @regeringschefen and @abratusek are fake or unofficial accounts. The tables have been updated accordingly. While Euromaidan protests continue in Ukraine, social media and digital communication technology still play a key role in their organization. Especially after the government’s violent repression on 30 November, Euromaidan has turned into a mass anti-government movement in the country and has begun to resemble the 2004 Orange Revolution in many ways. One of the major differences, however, between Euromaidan and the 2004 protests has been the use of new media, social networks and other IT tools for organizing and sustaining the protests. Since the beginning of the protests, Facebook in particular has played a central role in organizing protesters and informing wider audiences about latest developments. The first gathering of protesters, organized in Kyiv on the eve of November 21 and which was immediately dubbed Euromaidan (European Square), was sparked by the appeals of several journalists and civil activists, including Mustafa Nayyem [uk], a contributor of the leading independent online news outlet Ukrainska Pravda. Facebook and Twitter soon became the key platforms for coordinating protest activities and sharing information. The now official EuroMaidan Facebook page set a new record in Ukraine, reaching 161000 likes. The page is used to inform protesters about urgent news and issues, discuss plans of future actions, warn against using violence, share advice on how to deal with police forces, and much more. It has currently reached over 161,070 likes · 163,766 “talking about this” An English-language page Euromaidan has also been set up, along with regional pages like Euromaidan Lviv. Official Euromaidan Twitter accounts @EuroMaydan and @EuroMaydan_eng play a role similar to their respective Facebook pages, while they also help inform international audiences about the protests in Ukraine that initially went almost unnoticed by international media.Before these leading social media accounts emerged and accumulated their audience, users largely relied on hashtags (#Євромайдан in Ukrainian and #Евромайдан in Russian) to share information. As wee can see below, the Ukrainian version has been the most used to date. Many observers have noted how well-organized the main protest site, Maidan Nezalezhnosti (Independence Square), and the protest headquarters, the Kyiv City Administration building taken over by protesters on December 1, are. In fact, Independence Square has already been barricaded by activists who protect it during the day and patrol it at night. 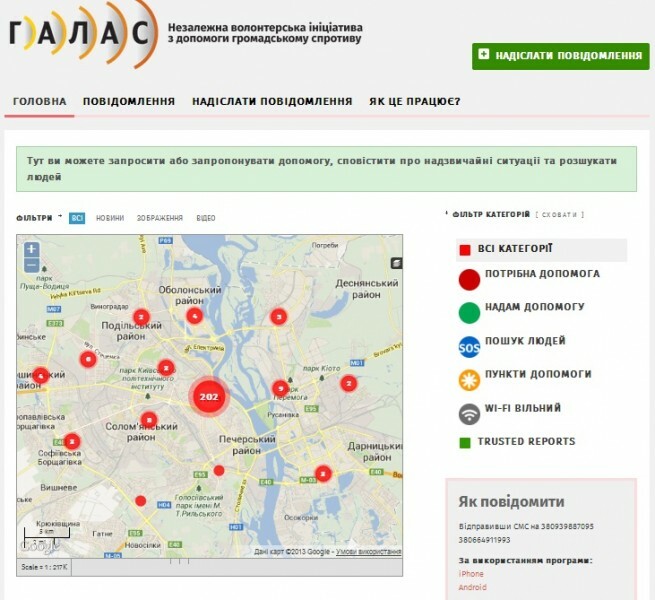 The website Galas.org.ua uses crowdmapping to coordinate the needs of Euromaidan participants with volunteers willing to help. A related Facebook page has also been launched. It appears that the people from the Nobel Prize organization were trying to get in touch with OPCW via “traditional communication” without success and that’s why they opted for the public social media sphere way. Sincere congratulations to OPCW for this extraordinary achievement and for pursuing a very noble cause in a time where conflicts have been reaching unprecedented levels of atrocity.